Okay, there is a new version up in the play store if you could please update. It now has Facebook login support and more improvements to user account creation and settings/profile. This allows you to set Fake GPS locations. What I suggest is to set yourself on the first tee of your favourite course using the Fake GPS app, then fire up Beagle to start a round and take a shot. From there you can switch between the Beagle app and Fake GPS to move around the course. If you're near a computer you can use the "Share this round" option in the menu to follow your progress in a web browser. Sweet settings are working (Although why the default is imperial and not metric is something I would change). Also when I chose 18 at the intial setup as handicap, in settings it had it as -7. Ok so when changing the settings as above, I can't see a save option so assume it saves automatically when you select and option or when using the back arrow at the top? If yes to either then it isn't saving as I have gone back in a couple of times and reverts back to original settings it had as above. Also Under settings if I go into Edit details and then save details at bottom, then use exit arrow across top in settings it crashes. Only things I have found so far. Thanks, that is really useful feedback especially in regards to the automatic save question. It actually does auto save as you make changes but I will pass that feedback to the UX designer. See how you go with the latest version and if you see further issues with the account/settings could you please PM me the account email address you are using? Done. Im getting the spinny wheel of death for an extended period of time. When i edit my details, it won't let me add an email address. Hey Rob, you're all sorted now correct? Why the live shot data? The stats tracking, etc. Yep, get that, but the live publishing of shot by shot data? What's the market for that? Tour pro? I can't see many being too interested in what some amateur weekend hack is doing... Or, am I missing something? Used it today for the first time. GPS was within 1m of my Garmin g7 every time. 1. It would be nice if there is an 'in the hole' button for putting. 3. Would be very helpful to be able to go back over the round and see each shot and know what club i hit etc. 4. Would be good to have a fairway hit, GIR etc. Also how many putts i had. Does it feel like you aren't finishing the hole or that your data is not being saved? I didn't mention that you can long press on each shot marker and drag it wherever you like. I wanted to see if that was intuitive. I'll post up a gif of this later. If you load up the app again you should see the round in your history. Once you click that it will take you to the map view of your round. You can long press on shot markers to move them around if they are not in the correct spot. I have plans for some of those features. Will keep you posted! That's great news about the long press thing. I guess with the putting its a bit difficult to add a shot after your first putt. I ended up just adding my shot as per normal, but for 2nd putts, i just added an extra shot on the scorecard side of things. So after the round, the only way i cam see my club info for that shot is via the Live round section? I agree. 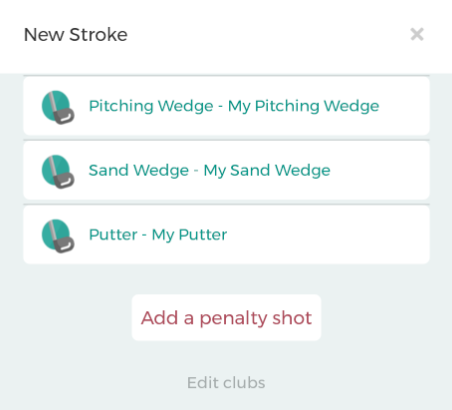 Marking more than one putt with the app is about the limit when playing with others. The Beagle device certainly solves this issue... you can get through the entire round without touching your phone. I'm pleased to hear that the separation of the shot tracking and score keeping was intuitive. For now yes, but I'll pass that feedback onto the UX designer and see what else we can come up with. I cant manually move the gps position. If i try to, it tells me to enable manual mode in the settings. Can't find that in the settings. I hit one into the weewee today. Can't find how to add a penalty. Edited by RobNewy, 29 October 2017 - 01:52 PM. Hey Rob good to hear. The penalty is right at the bottom of the club selection dialogue when taking a new shot. Here is a gif showing how a long press on an existing shot marker allows you to move it to the desired location. That gif is from post round? Ithink i have just found the gps moving thing for during the round. In the settings section there is a bit right down the bottom under Beta Testing.